In February 2009 I adopted my little mini JRT Heidi, but working full time, a few months later I decided it was time to adopt a little friend to keep her company while I was out. 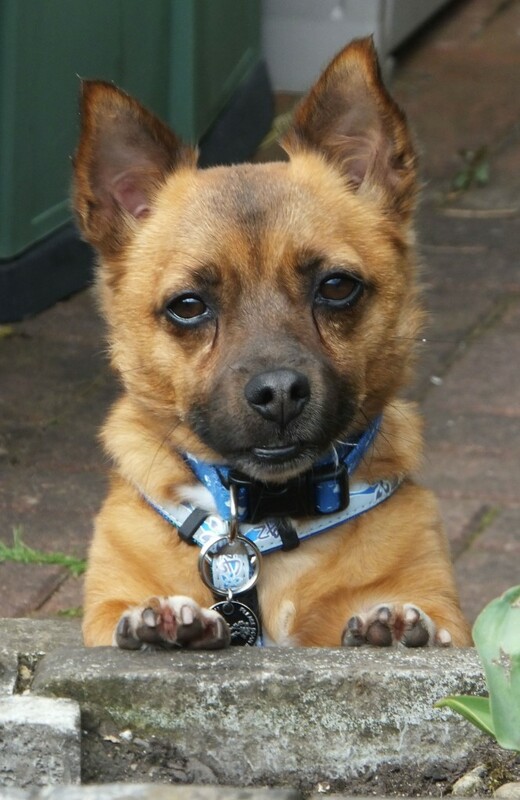 I looked through all the animal welfare sites and spotted Max (or Maxie as he came to be affectionately known). He had been surrendered by his owners and was in the DAWG shelter in Doneraile. Maxie was a very special little guy of heinz 57 variety! He had an underbite (so his bottom jaw and teeth were always sticking out) which made him extremely cute looking, and of course he had those wide-set brown eyes that used to melt my heart every time. He nearly broke my heart too trying to toilet train him and I thought he’d never master the cat-flap (although he grew to like the cats)! Maxie wasn’t the most intelligent of dogs (Heidi got the brains but Max got oodles of character to make up for it!) but once he eventually learnt something he remembered it forever! I don’t know what his history was but something or someone affected him…he had his “issues” 🙂 . He had a vulnerability about him that would tug at anyones heartstrings and that made me extremely protective of him. He was a dog full of quirks and unique character. For a small little guy he had the most amazing welcome for me every time he saw me, wagging his entire body (as well as his little stubby tail! ), and trying to get so close to me it felt like he’d almost bury into my body if he could!. He’d push his little head into the side of my leg and bend his whole body in sideways to get even closer…i used to call it “the Maxie special”! and it was a privilege to be on the receiving end of it. But if he was frightened he’d shake his whole body with equal vigor and i’d tease him about his “shaky tail”…he had a heart murmur that used to drive his vet mad as he’d shake so much on the exam table she could never quite assess it properly….oh and he had a “sniffy nose”….he’d smell things so closely with his little nose twitching a mile a minute, only for it all to end in a gigantic sneeze that would startle him so much he’d jump backwards! Not to mention his “tazmanian devil show”, where he used to chase around under the furniture like something possessed, making all sorts of vocal sounds, then he’d suddenly stop dead in his tracks, look around him with a confused expression on his face, turn, and do it all again facing in the other direction!. Makes me laugh and cry at the same time just remembering that! I think Max used to see “ghosts” – there’s many a time he’d stand growling, shaking and barking at his toy box and i’d have to take each toy out individually and allow him to sniff each one before he’d finally stop shaking and all the “spooks” would be gone!…or he’d growl at a shadow or reflection and i’d have to walk to where the shadow was cast or the reflection was, to prove there was no danger before he’d calm down! He’d sell his soul for a squeaky toy and tis many a night the toy box had to be confiscated due to the noise levels….what i wouldn’t give to hear (and see!) his antics with his beloved toys once again! Maxie had a special “Maxie smell”, it was like a baby smell and only he had it…no matter what i washed him in , he always smelled of “Max” and he had a deceptively soft silky coat as well….he was a cuddler and highly affectionate towards me and people he knew….a one in a million dog, a dog I’d give anything for, just to hear him barking again at random things he’d see through the hedge….he was so small he’d often stand on his tippy-toes trying to see things…i have hundreds of photos of him but I just love this simple one….I had his squeaky toy in my hand and he was hopping up and down trying to coordinate himself to jump the (very small!) wall to get to it!. I miss him so so much, I miss his cuddles, his licks, the way he’d always sit daintily “to the side”, I miss the way he’d only cross at certain points on the roads (he was extremely stubborn but that just made me love him all the more)…few people could bring him for a walk as they didn’t know his “routine” and he’d sit on his bum if they tried to make him cross somewhere he didn’t want to, its many a time he ended up being carried back home!. He couldn’t climb up on a kerb like a “normal” dog either but had a special so-called “Maxie jump” that involved launching himself at any kerb from a couple of feet away and splaying his body out flat like the jump up was an enormous feat to accomplish! Another endearing characteristic was his total clumsiness!….he’d often head off at a run, only to trip over his little paws (his back legs seemed to be longer than his front ones!) and he’d somehow manage to land on his back with his paws in the air…..then he’d struggle to right himself, his whole little body rigid with the effort …..he was one of those dogs I could never in a million years teach to “roll-over”….he just didn’t have the coordination 🙂 I don’t think he inherited quite the full set of doggy genes 😉 …although he did eventually learn to “give the paw” and “give the other paw” – his cute expression and big eyes looking up at me for his treat while doing so, is a much treasured memory. Heidi was his best friend and although she used to boss him around (typical JRT style! ), they were like two peas in a pod and could often be found sleeping intertwined with each other (when they both weren’t up on my lap keeping me warm!). Max’s little life was cut tragically short and I lost him a year ago next month. To say i miss him would be an understatement, he enriched my life no end and I was very lucky to have had him for a wonderful four and a half years. He left a great big Maxie-shaped hole in my heart (and cold-spot on my lap) that nothing can ever fill. Losing him was just the same as the death of a family member or close friend….the same pain, the same grief, the same emotions. If Max could have written a will I know he’d have wanted his place on this earth to go to another dog that needed it. One day not long after Max died I unintentionally spotted a little dog that needed a forever home…i’m not sure how I knew that this dog was for me but i just knew, it was like Max was telling me (and no i’m not mad! 😉 ….Teddy (as i called him) will never replace Max but i know Max would have approved (it was like Max was sending me sunshine through the rain that day). One day they’ll both get to meet each other and play together at the Rainbow Bridge. You were my little treasure Maxie and I hope I have done your memory justice. I may have rescued you but there’s many a time you may as well have rescued me. You were my loyal companion who accompanied me through thick and thin for four and a half years and your legacy lives on for me in so many happy and treasured memories. You weren’t perfect but you didn’t need to be – you were my Maxie, I loved you just the way you were and I was so lucky to have got to adopt you. You asked for very little Max but gave so very much to those that were fortunate enough to have known you.